- Original wing with VGs instead of slats. - Savannah ‘VG’ leading edge. In 2006 I was the first to remove the Slats from the Original Savannah wing and add VGs to regain pretty much the same STOL performance as with the Slats, while much improving cruise speed and fuel efficiency. This discovery was surprising to me at the time, but the results were very real. The very reason for employing Slats on an aircraft is to provide superior STOL performance, so this somewhat radical move of removing the Slats and replacing them with VGs has raised a lot of controversy and scepticism as to the STOL performance of aircraft after the change. But in direct response to my results, and their own follow-up tests, the ICP Savannah factory eliminated the Slats from their production aircraft, and brought out a ‘VG’ model. Many Zenith 701 owners have independently tried the change, and are pleased with the result. But scepticism still remains, so definitive comparison test data is required. I happen to enjoy experimental testing work, and greatly value any real independent data as distinct from manufacturers’ hype, so have been wanting to do these comparisons for some time. I started out as a sceptic of VGs (vortex generators) being able to have such an effect on high-lift wings such as these, but curiosity led me to try them and I was very favourably impressed. As a result of that discovery I began to manufacture and market VGs, which has now extended to the broad aircraft market. So I do have a vested interest, but this application of VGs to the somewhat narrow market for normally slatted aircraft is inconsequential to the overall aircraft market, so it’s certainly not the driving force. It’s simply that I’ve stumbled on a discovery that has proven to be of significant benefit in broadening the envelope of these aircraft, and I wish to share that info for any who may also benefit from it. I fly 150-200 hrs per year, with as many x-country trips to the Australian outback as time permits, often landing off-strip, so both fuel efficiency and STOL performance are important to me. On my last 60hr trip in May ’09 http://www.stolspeed.com/tailwinds-to-the-nullarbor I saved A$350 in fuel costs compared to if I still had the slats, and I still have the STOL capability so I could land off-strip in several places. (In the 900 hrs since removing my slats, that works out to a couple of thousand dollars in fuel savings...) Tomorrow I’m away again on a 750nm outback flight to the Birdsville Races / Fly-In / Beer-Drinking / and generally Heck-Raising weekend. (If you can’t cut loose and raise heck way out there, then where can you....) (I don’t really cut loose any more, but it’s fun to watch). Of more interest to me on this trip will be a couple of remote sites along the way that I’ve spotted before, where I want to have a go at landing off-field and camping the night, that’s my biggest thrill on these trips! It’s this sort of adventure flying that I’ve been optimizing my aircraft for, and emails I receive from visitors to my website, indicate that many want to do similar in their ‘patch’, wherever in the world that may be. Anything I can do to help them optimize their aircraft to realize those dreams gives me great satisfaction. Many thanks to Ken for the loan of his aircraft for all these tests. They took many hours of flying time, and took his aircraft to the limits of the envelope many times. The first will be comparing the Original Slats to the Original wing with VGs. The second portion compares Original wing with VGs to the Factory ‘VG’ wing. The ASI has been calibrated against a Hall airspeed gauge mounted on a vane that swivelled to always face the airflow directly. Can’t guarantee that the readings from the Hall gauge are truly accurate, but it sure shows how the standard straight pitot diverges radically from linear of at very low speed and the corresponding high angle of attack. With the conventional straight pitot, the ASI readings were linear down to 34 kts, then diverged considerably – ie - indicated 25 was actually 30. With the straight pitot, and the original slats and hanging on the prop at considerable power, it was possible to read zero on the ASI, for a real airspeed probably 27 kts. The straight pitot loses it’s effectiveness just at the critical speeds we are trying to measure..... Overseas wind tunnel testing indicates that pitot effectiveness changes radically when the critical AofA is reached, at about 16º. (Aircraft owners and manufacturers claiming stall speeds way below 30 kts on any aircraft without an exceptionally low wing loading, are probably reading considerable pitot error.....) So I extended the original pitot tube, with a 10º downward cant to better match the airflow at high angles of attack. With this canted pitot, the ASI readings matched the Hall gauge right down to 30 kts. This canted pitot is especially essential for correctly measuring stall speeds at the corresponding high angles of attack that this wing is capable of. Verifying these low speeds with GPS is difficult. Any GPS reading in only one direction has no validity at all! At the very minimum, a second reading at the reciprocal heading is required, and 4-way readings are far more indicative. The slowest I could do dependable 4-way GPS readings was at 35 kts indicated ASI, and these runs averaged to 36 kts. I can’t be certain that the lower indicated speeds are absolutely accurate, but I am reasonably confident that this ASI/pitot/static combination is pretty close to true at these speeds, and more importantly, is consistently repeatable, which is the key factor in comparison testing like this. The Slats to the Original wing with VGs. These test results should apply equally to the Zenith 701 as well, since the wing profile and slat arrangement is exactly the same as the Savannah, only the 701 wing is shorter and has a significant cut-away over the cabin. At 2000 QNH, 14ºC, 430kg. - The stall speed ‘clean’ was only 2 kts less with Slats than with VGs. - At ½ flap the stall speeds were identical with both configurations. - Speed for best rate of climb was 50 kts with Slats, and 55-60 kts with VGs. - Best rate of climb was 200 fpm higher with VGs instead of Slats. - Best glide ratio with slats was 8.2:1 @ 45 kts. - Best glide ratio with VGs was 9.1:1 @ 50 kts. - Minimum glide speed, engine stopped, for both configurations was 35 kts, with considerably reduced but very similar glide ratios. The latest cruise speed data with Slats has been lost, and unfortunately cannot be repeated because the slats are now permanently removed. Earlier tests showed an average of 6 kts increase without Slats. - At cruise power the airspeed is about 6 kts higher for the same power setting. - On take-off without slats the aircraft noticeably accelerates more quickly to best climb speed, and then climbs at a much higher rate of climb. - On pulling power to idle, the aircraft with Slats decelerates more quickly and requires a more nose down attitude to maintain glide speed. Landing flare characteristics are quite different Slats/noSlats. With Slats, the drag increases exponentially as the angle of attack increases and thus the airspeed bleeds off very quickly. With Slats, a careful balance of power right to touch-down is highly recommended. Without Slats the aircraft floats on much more like conventional aircraft. There’s no abrupt stall, so an increasing hold-off transitions very gradually to a gentle set-down. Actual touchdown speed is very much the same, Slats/noSlats. A judicious application of power right at the last instant of the hold-off can result in a very slow touch-down speed with either configuration. - With Slats, the best angle of climb speed was 40 kts @ 930 fpm, which calculates to a climb angle of 13.4º. - With VGs, the best angle of climb speed was 47 kts @ 1070 fpm, which calculates to a climb angle of 13.8º. Surprisingly, the actual measured best angle of climb with the Slats was no better than with VGs, in fact the wing with VGs is slightly better! I would have expected the Slats to be better for angle of climb at slow speed, but not so. The slower speed and higher angle of attack with Slats distinctly give the feeling of a steeper climb, but it’s not real. A drawing on the Zenith website indicates a much steeper angle of climb with Slats than with VGs, but these real life measurements don’t support that claim at all!! The massive drag from those slats at high AofA degrades the lift/drag ratio, and consumes power that could otherwise go to climb. The curve shows that with Slats the performance drops off quickly at speeds only 5 kts below or above the optimum 40. With VGs the curve is much flatter, and performance remains the same over a wider range of speeds. In the event of an engine stoppage on climb-out the VGs provide a much better chance to recover. With VGs the greater margin between best angle of climb speed (47kts) and stall speed (30kts) provides a much better opportunity to nose over into a glide. With Slats that margin is less, and the much greater drag of the slats at this very high angle of attack very quickly reduces airspeed to the level that performance is much degraded... The higher best climb-out speed with VGs also gives a better margin for wind shear and turbulence effects. So these measurements indicate that an aircraft with VGs will climb out of a tight spot every bit as well as one with Slats. The Original wing with VGs to the Savannah ‘VG’ wing. This section will apply particularly to the Savannah owners. In 2006 I was the first to remove the Slats from the Original Savannah wing and add VGs to regain pretty much the same STOL performance as with the slats, but much better cruise efficiency. I had also expected to need a ‘finer’ leading edge for less drag, and had already made up new ribs for a new leading edge very similar to that used by ICP, but initial test results with the Original leading edge were so good that I never used them. The smaller radius leading edge could be expected to reduce profile drag slightly at higher speeds. The extended leading edge of the Factory ‘VG’ wing increases the wing area by 0.51 m2 (5.5 ft2). This lowers the wing loading slightly, but the increase in the chord actually lowers the aspect ratio slightly. The span loading factor remains unchanged. Ever since ICP Savannah brought out this Factory ‘VG’ wing, I’ve wanted to do flight test comparisons between it, and the Original wing with VGs instead of Slats. Just out of aerodynamic curiosity, to see what difference such changes really make to performance and handling. Savannah owners who had done the conversion reported very little change, but none had done careful before-and-after tests. At 2000 QNH, 14ºC OAT, 430kg. With Brolga prop pitched for climb, wide open straight and level at 6000rpm. Speed tests were done by 4-way GPS at 2000 QNH, OAT 14º. - The Factory ‘VG’ wing shows cruise speeds up by 1-1.5 kts. - The Factory ‘VG’ wing shows a slight advantage in climb rate at higher speeds, but equal at low speed. - The Original wing w/ VGs gave stall speeds 2-3 kts slower, and a softer stall. - Best angle of climb speed was 45 kts for both Original w/VGs and Factory ‘VG’. - Best rate of climb speed was 55-60 kts for both wings. - Best glide speed was 50 kts for both configurations. I couldn’t feel any difference in flight characteristics between the configurations. I can’t feel any difference in landing characteristics. The ultimate stall is a little slower and ‘softer’ with the Original wing w/VGs, but not any difference that I could detect in real landings. As would be expected, the finer radius leading edge of the Factory ‘VG’ wing gives less profile drag at speed, so a slightly higher cruise speed at the same power, but only small increase. The reduced profile drag also gives a slightly better climb rate at speeds above 50 kts, but no change at slower speeds. Best angle of climb speed was 45 kts for both Original w/VGs and Factory ‘VG’, at a rate of climb of 1070 fpm, giving a climb angle = 14º. The Original wing w/VGs stalls 2-3 kts slower than the Factory ‘VG’ wing. I would attribute that to the fully-rounded, large radius leading edge, which aerodynamic history and experience has long shown to be very favourable to slow stall speeds. No way was I able to get near the 23 kt stall speed claimed in the dealer’s literature for the Savannah Factory ‘VG’ wing (see pitot error notes above). The Original wing w/VGs could still glide at 35 kts, despite at a quite degraded ratio, but the Factory ‘VG’ could not hold at this speed at all. I could find very little difference in performance between the two wings, and no faults with either of them. The Original wing w/VGs is actually slightly better at very low speeds. It’s claimed that six aircraft flying with the Original wing with VGs have come to grief. We need to know if that particular configuration of the wing had any contribution to those accidents. The results of the testing just completed reveals no lack of performance of the Original wing w/VGs, when compared with the other two configurations, that would account for the accidents. We need to study all of those incidents in careful detail, and weigh in all possible contributing factors. I know the details of three of those incidents, detailed below, and am seeking details on the others. The information I present on these three incidents was obtained very soon after each event, in two cases directly from the pilots involved, and in the other from a third party who spoke with the pilot very soon after the incident. From previous experience of watching and listening to accounts of accidents, I’ve noticed that it’s very important to put most weight on the initial spoken account as soon after the incident as possible, including as much surrounding detail as possible. There are usually a combination of factors, some seemingly irrelevant at the time, that combine to contribute to the end result. Often the story evolves over re-telling, and some significant factors get left behind. Once a single factor is focused upon, the often significant contribution of others is often discounted. It’s very important to still keep all factors balanced in the final analysis. It was published elsewhere that all of those six incidents were at heavy gross weight and challenging weather conditions. As you will see, examination of two of the incidents that I do know of would indicate that both these factors were very significant in each case. In the third incident, an unconventional full-flap take-off configuration, in tricky atmospheric conditions, would have had a very significant effect on the outcome. In all these tests I’ve tried my very best to find any weakness in the Original wing with VGs. None at all have showed up. In all the 500 hrs that I’ve flown this wing, I’m always observing it’s response to a wide variety of situations at the limits, and it’s never let me down. All this experience has given me great confidence in the dependability and forgiveness of this wing. My conclusion would have to be that, those aircraft with the Original Wing with VGs that came to grief would have suffered the same fate if flown with the same load, in the same manner, in those same conditions, even with Slats or the Factory ‘VG’ wing. For a start, the Yellow 701 shown in the photo is not the aircraft that had the accident. That’s just owned by the fella doing the repairs on the Savannah which got damaged. The pilot involved in this incident has since contacted me directly. He confirms that this account and analysis of the incident is exactly correct! He did have a significant comment that needs examination, see ‘Fat Chicken Syndrome’ below. The pilot of another Savannah that was wrecked, stated to me right after the incident that they were at a heavy gross weight, with two large men and lots of fuel. It was a take-off towards significantly rising ground, with a very strong wind blowing over the high ground and down that slope. They were struggling in the climb up that rising ground and descending airflow, so he turned across the slope, and doesn’t remember what happened next, until sitting in the wreckage..... He stated that his preferred climb speed was 45-50 kts, so at this load the angle of climb was already not the best, and if the speed inadvertently slowed at all, then climb would have been further degraded. A climbing turn while struggling at slow speed at maximum angle of climb is a perilous manoeuvre in itself, and losing the headwind component compounds the situation. As they say, go figure...... The previous test results indicate that neither Slats nor the 'VG' wing would have performed better in this situation. I know this pilot well. He’s considerably experienced, and competent at STOL Ops, and I understand what he was attempting. In this case, he had landed his Savannah off-field to assist a friend in a Drifter who was forced down by an engine out. The ground turned out to be very rough, but the Savannah survived the landing. Due to the very rough ground, he elected to use full flaps momentarily to ‘jump’ the aircraft off the ground really short, then go to first stage flap while holding the aircraft down in ground effect to build up speed for the climb-out. This is a recognised technique for EXTREME STOL Ops, and it sounds like he did it right, but the margin is so fine that many factors can make it go wrong very quickly. I hear comments, sometimes repeated by those who haven’t even flown these aircraft, that the Original wing w/VGs is prone to ‘drop a wing’, but I have never ever experienced that, despite giving it every chance, hundreds of times. The most I have ever had is a ‘sag’ of a wing at the limit in an idle stall, with the ball off-centre, which is easily corrected by rudder. This can be more pronounced if the remaining slats brackets have not been removed and the ball is not centred, but is still easily picked up by rudder and an easing of the stick. I recently repeated further tests at altitude. Very steep climb with fully crossed controls, no wing drop. Slow climbing turns at full power, both ways, no wing drop. I could not find any evidence of a tendency to drop a wing, no matter how I tried. I also tried rapid aileron reversals while in steep slow turns and always got positive response in both directions in the clean and 1/2 flap settings. Only at FULL FLAP did the sudden aileron reversal sometimes cause a wing drop, the same for both the Original wing w/VGs and the Factory 'VG' wing, but even more so with Slats. Of course the risk is related to the slower lift-off speed with slats, and thus could apply to the Original wing as well, if it's yanked off the ground below safe flying speed. Those repeating the statement that the Original wing w/VGs is more prone to dropping a wing need to produce some creditable evidence to support that claim. At full power slow climb, it’s ‘torque roll’ and associated prop thrust effects that is often mis-interpreted as ‘wing drop’. The torque from 100hp, geared to a large high-thrust prop is enormous, and add to this the gyroscopic forces while rotating suddenly on lift-off, P-factor, and asymmetric prop wash, all the while ‘hanging on the prop’ at a very slow speed. At that very low airspeed, the aerodynamic forces on the control surfaces are minimal. The only control surface that is very effective in this situation is the rudder due to the velocity of the prop wash, and very considerable right rudder is needed when at full power in slow climb. Inattention to sufficient rudder for a centred ball leads to an increasing roll to the left, which if then reacted to mostly by aileron, can lead to continued and increasing roll and slip. The proper reaction to this ‘torque roll’ is rudder to centre the ball and immediately ease the stick to straight and level attitude to quickly accelerate to proper flying speed, but I feel that too many pilots who have come to grief have reacted to the torque roll with aileron while continuing the steep slow climb...... So my assessment is, that the claim of a ‘wing drop’ at full power climb is due not to the wing stalling, but to the mis-handling of the power factors outlined above. I’ve experienced this torque roll effect when ‘hanging on the prop’ in all three configurations of this wing. I find it no more prevalent with the Original wing w/VGs, than with the Factory ‘VG’ wing, and I’ve tested both of them to the limit many, many times. With the original Slats it was even more evident because of the slower speed and higher AofA that could be attained, and the higher drag which slowed acceleration to a safe flying speed. “... flaps at 40º, and “stick pulled on until take-off...”. The aircraft immediately rotates to a high angle of attack and almost immediately jumps off the ground, hanging on that massive thrust, at an attitude of maximum induced drag, and before the airspeed is sufficient for the rest of the aircraft to fly properly. Attempting to correct torque roll with aileron while in the FULL FLAP configuration can lead to a wing drop in the opposite direction to the control movement. FULL FLAP SHOULD NEVER BE USED ON TAKE-OFF!! The pilot of Incident #1 discovered a significant risk factor when he was re-training with a flying instructor after the aircraft had been repaired. The Factory VG wing had been installed during the repair. On a take-off run he pulled the nose way high very early in the run. The aircraft then trundled a long way down the runway in this attitude, and only lifted off when he eased the stick and lowered the nose a bit. An earlier pilot, test flying a Savannah after changing to the Factory VG wing, had noticed the same phenomenon, and described it, “.... like a fat chicken running with it’s wings extended, trying to fly but not able to get airborne....” I also experienced that same phenomenon myself one time, once again in an aircraft that had the Factory VG wing installed. I’ve never been able to repeat that effect with the Original Wing with VGs, despite having tried many times. It appears that the very high angle of attack has caused that wing to stall while still on the ground, and the high AofA causes so much drag that the aircraft has difficulty accelerating to flying speed. The aircraft that hit the fence in Incident #1 had the Original Wing w/ VGs, but the drag of the deep grass combined with the drag of the very high AofA prevented it from gaining enough airspeed to lift off properly. Also, that very nose high attitude means that much of the prop thrust is trying to lift the aircraft rather than accelerate it to airspeed. Even if it had lifted off in that attitude, it could have been susceptible to Torque Roll as detailed above. Far better to first just lift the nosewheel off the ground and accelerate a bit more before hauling back. It only takes a very short distance at that shallow AofA behind 100hp to get enough speed to fly away safely. It has been suggested that the Original wing w/VGs configuration, which I fly and advocate, may be adequate for light loads but inadequate for heavy gross loads. It would very much concern me if this was true, so I loaded both my aircraft with the Original wing w/ VGs, and another aircraft with the Factory ’VG’ wing, with sandbags to 560kg (1232 lb) take-off weight, and flew comparison testing. 560kg is the MTOW designated by the ICP factory for this aircraft, so I see no need to test heavier, even tho I know some owners are loading even heavier than this (more on that issue later). The sandbags were distributed to keep the CofG within range as if a heavy passenger, full fuel, and 20kg baggage were loaded in the original baggage compartment, as per factory recommendations. Different ASI instruments in each aircraft, but same brand and model, and both compared to the Hall gauge as best as is possible at those speeds. The same canted pitot extension was used on both aircraft. - Stall speeds for both configurations were up by an average of 5 kts from the lighter 430kg loading. - The stall speeds of the Original wing w/VGs were consistently 2 kts lower than the Factory ‘VG’ wing. - Best angle of climb speed is up 5 to 50 kts for both configurations. - Best glide speed for both is up 5 to 55 kts. - In engine-off glide the Original w/VGs could still glide at 40 kts despite a very degraded ratio, but the Factory ‘VG’ wing was unstable and sinking rapidly at that speed. The stall speeds were increased, as would be expected, but none were more abrupt or unpredictable. No wing drop or nose-drop, just an increasing ‘mush’ that could be instantly checked by easing the stick. No feeling of loss of control. Both wings could still climb at 40 kts, the Factory ‘VG’ wing buffeting considerably, but still producing 450fpm. Considerable ‘torque roll’ influence noticeable at his speed with both wings, and considerable rudder input required to keep wings level while in steep slow climb. - I could find no real difference in performance at heavy gross load between the Original wing w/VGs and the Factory ‘VG’ wing. 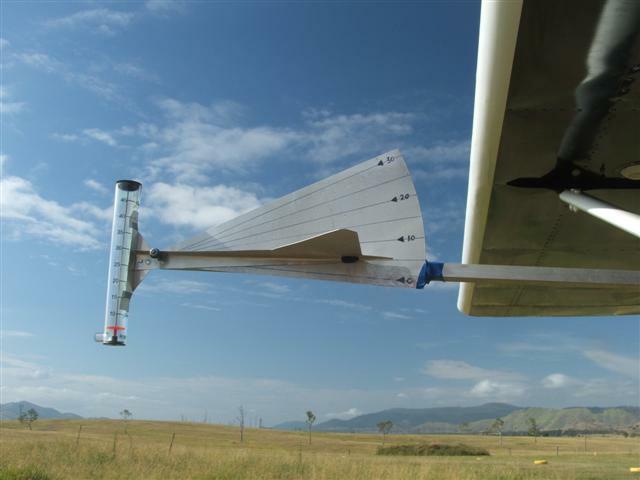 - It's very important with either wing to maintain higher speeds at heavy loads. The above image graphically shows the effect on angle of climb at different loads. The Speed and Climb axes are scaled to be equal (10 kts = 1013 fpm). The speed for best angle of climb increases from 45 kts at 430 kg to 50 kts at 560 kg. The rate of climb at those speeds is down 320 fpm, from 1070 to 750 fpm, considerably reducing the angle of climb from 13.6º to 8.5º. Notably, there is very little loss of climb angle at 5 kts over the optimum, but a larger loss at 5 kts under. From these results I would aim for an absolute minimum of 50 kts at 430 kg or 55 kts at 560 kg, to give a safety margin in case of inadvertent slowing of the speed. Those aircraft that came to grief at heavy loads would have likely come to the same result with the Factory ‘VG’ wing or with Slats, when flown as they were flown, in those same conditions.